Detailed on Apple, owners of the third generation Apple TV can setup the streaming set-top by connecting over Bluetooth with an iOS 7 mobile device such as an iPhone or iPad. After connecting the Apple TV to the home theater, the user makes sure Bluetooth is enabled on the iOS 7 device as well as the home’s Wi-Fi network. After tapping the iOS 7 device on the Apple TV, a prompt will appear on the device’s touchscreen asking the users to input their Apple ID email username and password. Users will need to keep the iOS 7 device within approximately ten feet of the Apple TV to continue the process. Similar to the standard setup process, users have the option of turning on password memory when making rentals or purchases on iTunes Store. Obviously, if there are children in the home, it’s probably best to leave the password protection on to avoid unexpected purchases. 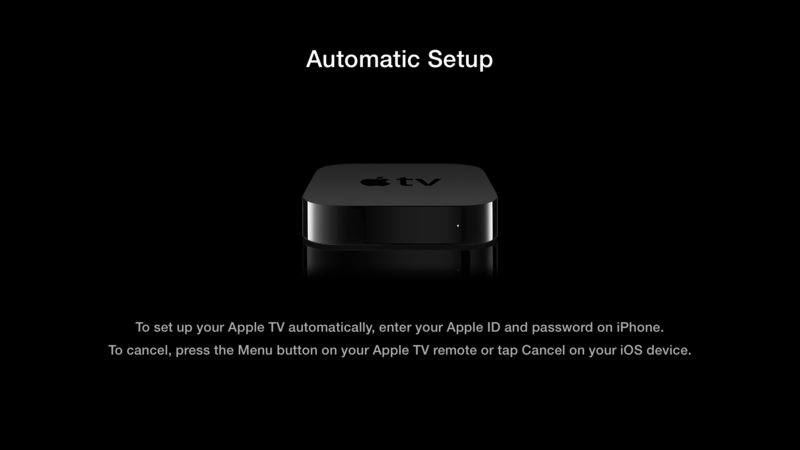 After a couple prompts on the iOS 7 device touchscreen, the Apple TV will launch into an automatic setup mode. This simplifies the process since the Apple TV receives information about connecting to the Wi-Fi network and iTunes Store login information without having to reenter it using the onscreen keyboard and remote control. Of course, this easy setup method only works on the Apple TV third generation in conjunction with an iPhone 4S or higher, iPad third generation or higher, iPad Mini or iPod Touch fifth generation or higher. It’s likely that Apple will use this process when setting up new Apple products in the future. For instance, all of this information could be transmitted when setting up a MacBook for the first time, thus making the setup process even simpler. Earlier this week, Apple had to re-release version 6.0 of the Apple TV software due to reports of “bricked” set-top boxes. Added features within the version 6.0 update include access to iTunes Radio and the iTunes Music Store for purchasing albums directly from the set-top box interface.